Who needs spring tulips when the kitchen garden offers Bright Lights chard! After picking a bunch of this lovely, overwintered chard the other day, I couldn’t resist arranging it in a rainbow and setting it out to admire. Years ago, I grew the more aptly named Rainbow chard from Thompson and Morgan but turned to Bright Lights when Johnny’s introduced it. Uprising Seeds in Bellingham offers Rainbow chard now so I may try it this year for a flavor and color comparison. 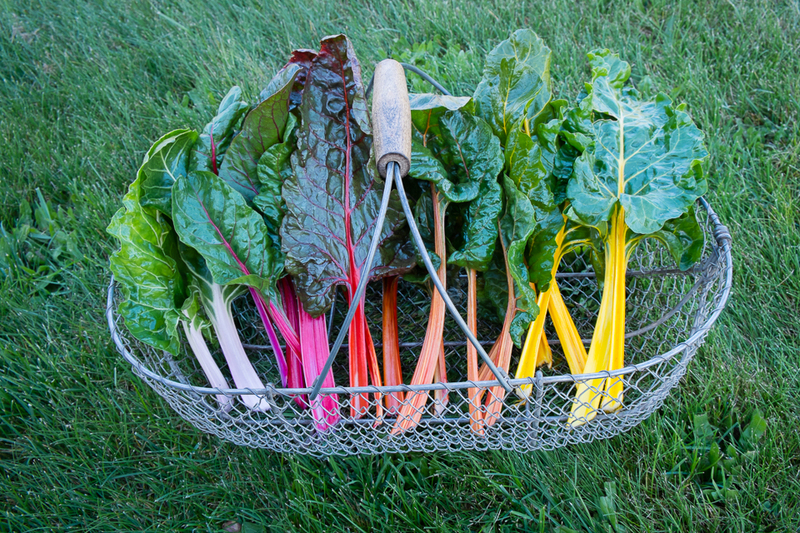 Bright Lights or Rainbow, this chard is as gorgeous in the kitchen as it is in the garden. I usually separate the stems from the leaves, chop them and steam them for a few minutes before slicing and adding the leaves. This method gives one more chance to admire the colorful stems and results in leaves and stems that are equally tender. 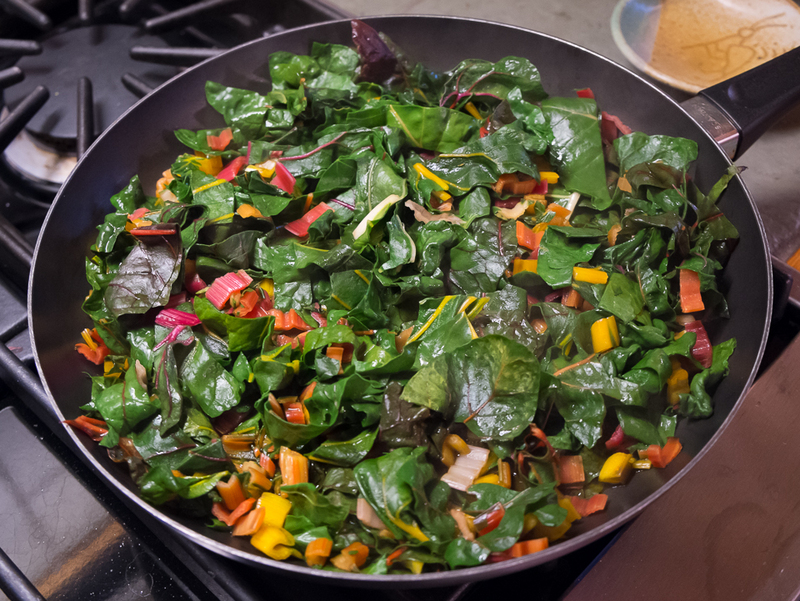 Chard has the same earthy flavor that kale has, but it is more melt-in-the-mouth tender. Eating it plain is such a treat that I often do no more than wilting it in the pan before serving it. Still, chard does blend well with other flavors. Garlic and olive oil, yellow raisins, toasted hazelnuts are all tasty additions. There’s also our longtime favorite pasta dish from Alice Water’s Chez Panisse Pasta, Pizza and Calzone (1984): Chard, Goat Cheese and Buckwheat Pasta. The sharp flavor of goat cheese is a perfect contrast to chard’s sweetness and the buckwheat pasta matches chard’s earthy notes. We often make emmer flour pasta instead of buckwheat and use half as much cream and twice as much goat cheese. This recipe is definitely one that invites variations. Chop the garlic Stem the chard. Slice the stems and cut the leaves crosswise in ribbons. Wilt the stems and leaves in a covered skillet until barely tender. Remove and drain. 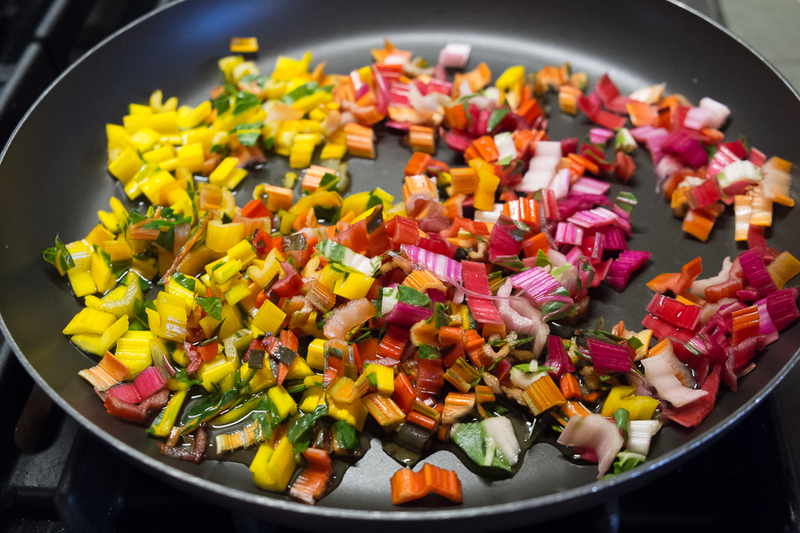 Melt the butter in the skillet, add the garlic and the drained chard and stew gently for 4 to 5 minutes. Season with salt and pepper. Heat the cream. Crumble the goat cheese, add half of it to the cream and whisk until smooth. Add to the chard and simmer gently for a few minutes. 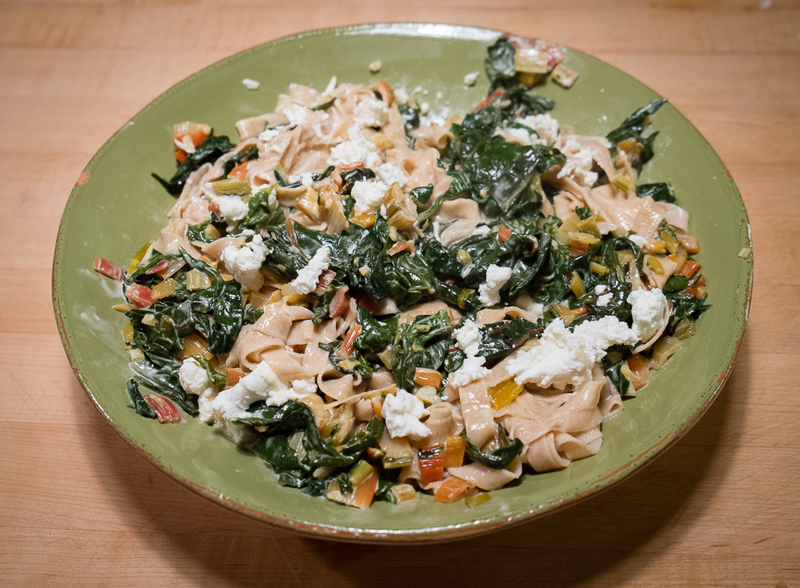 Cook the pasta and add to the chard along with the rest of the goat cheese. Mix well and serve garnished with black pepper. The leaves I’m harvesting now are from chard I planted nearly a year ago. Like kale and other hardy greens, chard overwinters in our mild northwest climate and begins growing again in the spring, just in time to match the tulips but much more welcome because we can eat it. The winter kitchen garden offers vegetables for harvest—leeks, roots, Brussels sprouts and hardy greens—but the kitchen garden has also provided storage vegetables to take us through the winter: potatoes, onions, shallots and squash now in cool storage, dried beans and dried tomatoes in the pantry, and packets of corn, shell beans and peppers in the freezer. Part of the fun of creating winter meals is finding ways to combine storage vegetables with each other or with vegetables still growing in the garden. The possibilities are endless. 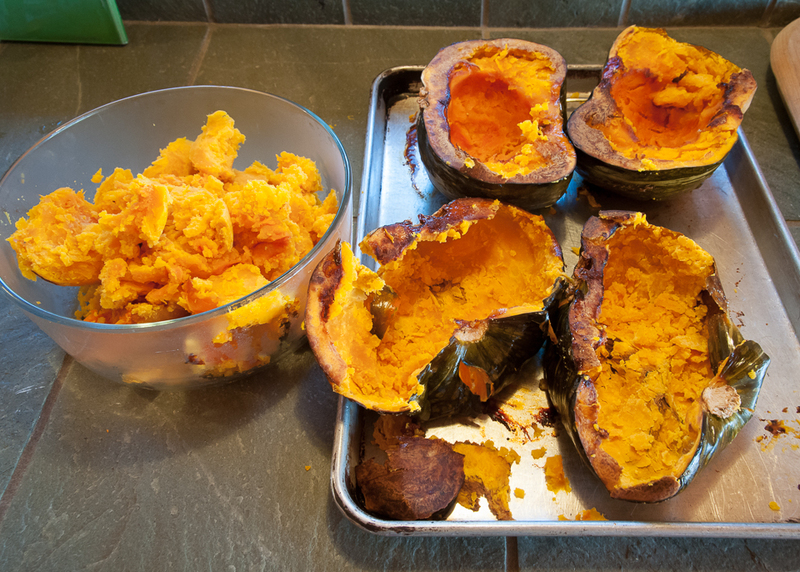 Winter squash is one of the stars in this adventure. The other day, I sliced open two lovely Burgess Buttercup winter squashes, removed the seeds and fibers and baked the squash cut side down on a sheet pan at 400 degrees until the rich, sweet flesh was soft and scooped easily from the shell, ready for soups, ravioli, sweet or savory pies. Friends were coming for dinner so I decided to make a savory squash tart, mixing some of the squash with sautéed Copra storage onions and thawed Poblano peppers I’d roasted and frozen at the end of the summer. The rich, nutty flavor of the squash combined perfectly with the sweetly pungent caramelized onions and spicy peppers. I added some grated sharp cheddar cheese to the mixture, filled the pastry shell, folded in the pastry edges and baked the tart at 400 degrees for about 45 minutes. 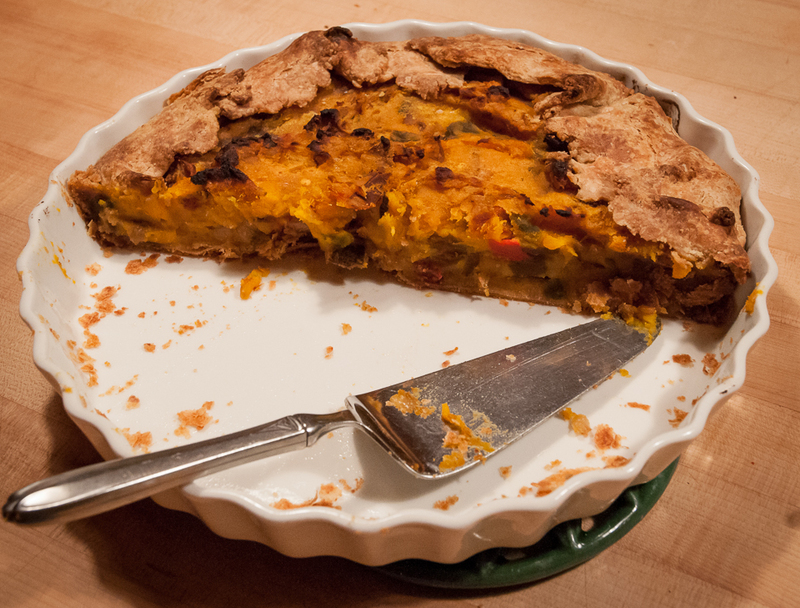 The proportions for a 12-inch tart pan were about six cups of cooked squash, a pound each of onions and peppers and a quarter pound of cheese. With some shell beans mixed with emmer farro from Bluebird Grain Farms (http://www.bluebirdgrainfarms.com/bluebird-emmer-farro.html) and a celery root, apple and mache salad, this rich tart made a great winter supper. 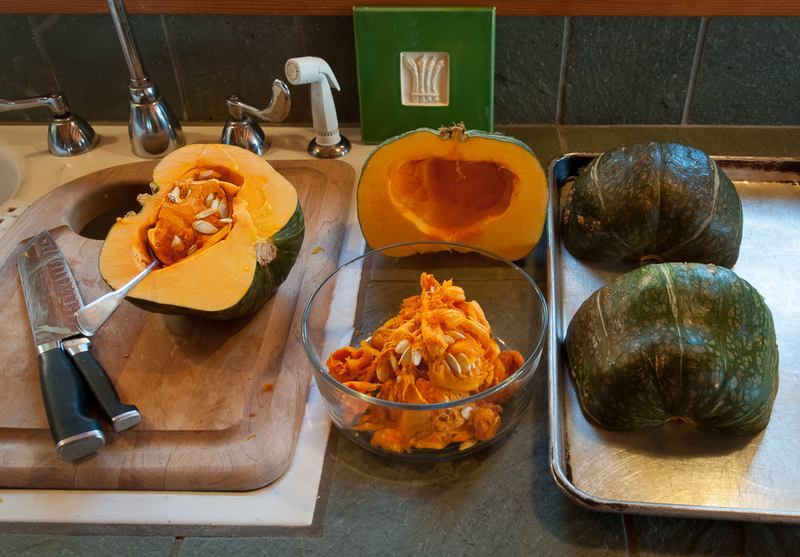 The seeds and fibers I removed from the squash went not to the compost but to the stockpot. 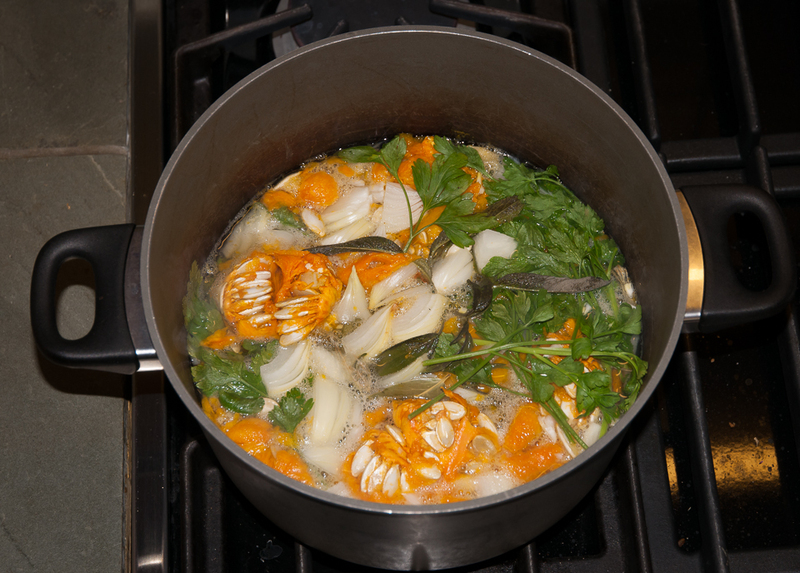 In her 1987 cookbook Greens, Deborah Madison recommends adding the seeds and inner fibers of squash or pumpkin to the stock for her “Winter Squash Soup with Red Chili and Mint.” Celery or celery root, onion, bay leaf, parsley, sage, salt and cold water combine with the squash seeds and fibers to make a flavorful base for winter soups. This particular winter squash soup is delicious, sort of like the tart filling thinned way down, but there are many other possible variations. Adding chard or kale, sautéed leeks, maybe some dried tomatoes or cooked beans, even some corn creates tasty new soups. The flavor and color combinations are pleasing and endless. And there is nothing like a soup experiment to cheer up a dreary winter day. Vegetable stews are another good way to combine winter garden and storage vegetables. 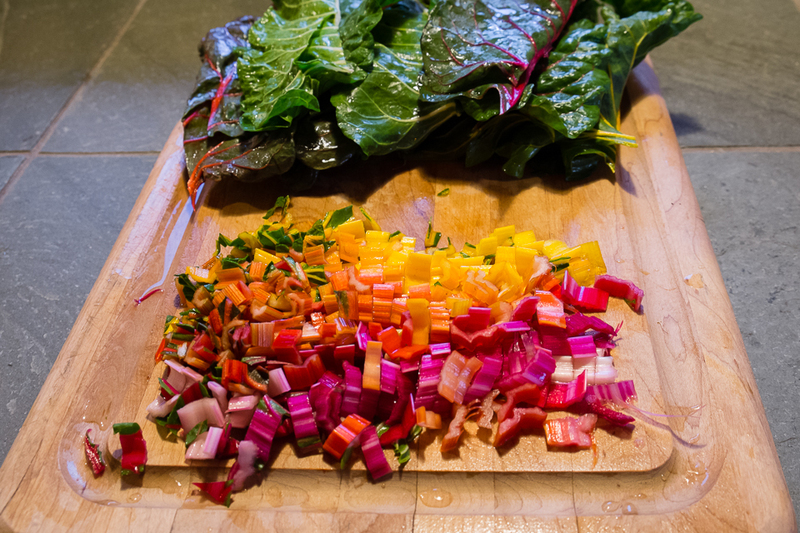 On a recent late afternoon in the garden, the colorful hues of rainbow chard tempted me to pick a bunch. Braised on their own, they would have made a beautiful side dish but with the addition of sautéed onion, chopped garlic, sliced dried tomatoes and thawed fava beans they became the background for a vibrant stew topping soft polenta. 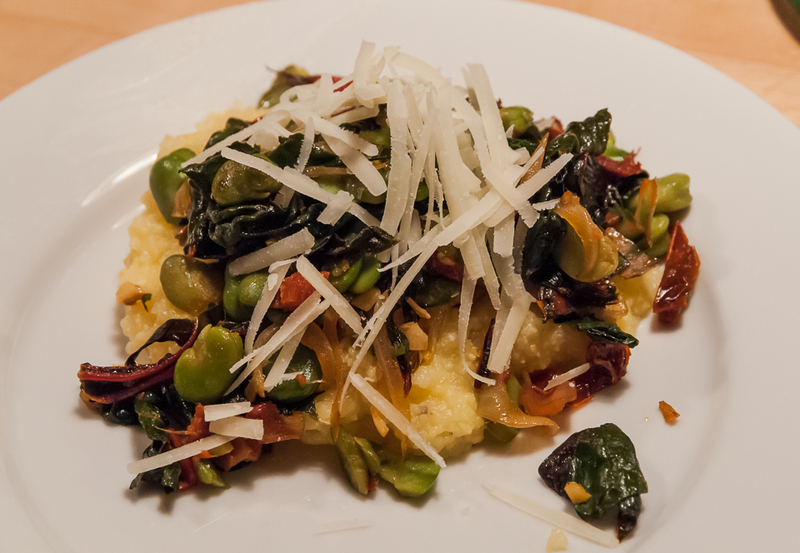 A little grated Pecorino Romano cheese added just the right salty flavor to the sweet, earthy vegetables and the creamy corn polenta. The night was dark and cold but this plate looked like summer, a most welcome thought.